A compound identified through research being conducted at Stephen F. Austin State University shows promise in the fight against cancer. 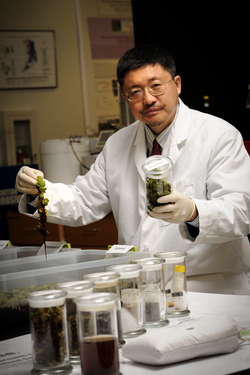 The same research, conducted by Dr. Shiyou Li, research professor and director of the National Center for Pharmaceutical Crops in SFA's Arthur Temple College of Forestry and Agriculture, led to the development of an approach to controlling giant salvinia, an invasive plant that is destroying fish and wildlife habitat and invading lakes and other aquatic resources across the state and throughout the world. A portion of funding for the salvinia research project was received from the National Institute of Food and Agriculture of the U.S. Department of Agriculture. Researchers at Stephen F, Austin State University have developed a method of controlling an invasive plant that is destroying fish and wildlife habitat, clogging water lines, and hampering boating and hydroelectric plants. Even better, their research has led to the discovery of an agent that shows promise as a cancer treatment. The totally new concept and approach to controlling giant salvinia is called "endocides" (endogenous biocides) and has been extensively tested in both greenhouse experiments on the SFA campus and in recent field trials by researchers at the National Center for Pharmaceutical Crops in SFA's Arthur Temple College of Forestry and Agriculture. "This discovery is very exciting," said Dr. Steve Bullard, dean of SFA's Arthur Temple College. "Since lakes and other aquatic resources in Texas and throughout the world are being taken over by this noxious invasive plant, endocides bring a new hope for controlling giant salvinia, one of the most invasive plants in the world." The main mission of the National Center for Pharmaceutical Crops at SFA is to discover and develop novel anti-cancer agents from native and invasive plant species. Since 1993, the science team has collected and screened about 1,200 species of plants and isolated more than 1,400 compounds, including 146 new structures. "Identifying new bioactive agents against human cancers has been our primary research focus; however, we have recently made great progress in controlling invasive plants, which are cancers to our environment. Giant salvinia is a perfect example," said Dr. Shiyou Li, NCPC director and research professor. Giant salvinia (Salvinia molesta D.S. Mitchell), also known as Kariba weed or water fern, is native to Brazil. This fern species has become one of the most widespread and environmentally, economically and socially destructive invasive plant species in the world. "It also provides habitat for snails that are intermediate hosts for Schistosoma spp., which causes the parasitic disease Schistosomiasis, the second most socioeconomically devastating parasitic disease after malaria," Li said. Since 1998, giant salvinia has invaded lake and river systems in the southeastern United States, California, Arizona and Hawaii. The plant can double its biomass in two or three days under favorable conditions and may still be alive after drying for days. "Dense mats of salvinia reduce oxygen levels and block all sunlight from penetrating the infested water body, seriously threatening native and cultivated aquatic plants and destroying fish and wildlife habitat," Li said. The salvinia mats often restrict boat operation, clog irrigation and drinking water lines, and foul hydroelectric plants. "The impacts of giant salvinia on recreation activities and water quality in the infested waters cannot be overemphasized," he said. During the past few years, more than 20,000 pounds of salvinia plants have been collected from various lakes throughout East Texas and Louisiana. Li's team has isolated more than 50 compounds including six new structures from the plant. One new compound, which has been named Salvinol, shows promising bioactivities against human pancreatic and lung cancer cells. "The discovery is in the process of patent application, and the result was published in a recent issue of Bioorganic & Medicinal Chemistry Letters," Li said. Although giant salvinia is very hard to control in the outdoor environment, Li found that salvinia was not easy to grow in controlled containers in his early greenhouse experiments. "After several experiments, 'autotoxicity' was identified as the cause for the plant's death in greenhouse containers," he said. "We realized that extracts of giant salvinia can inhibit and eliminate the plant in greenhouse experiments and coined the term "endocides" to refer to the bioactive agents with biocidal effects in salvinia and some other species." In three years of extensive investigations in the greenhouse and lab at SFA, and in recent field trials at the Research Center of the Red River Waterway Commission in Natchitoches, La., salvinia endocides have successfully controlled giant salvinia plants in various growth stages. "The endocides are highly selective in acting against salvinia species without damaging other tested aquatic and terrestrial plant species," Li said. To date, Li and his team have been able to identify a bioactive fraction and a bioactive pure compound from the active salvinia extracts. The field application methods of salvinia endocides have been investigated, and the potential of the concept in application of other invasive species are under investigation. The patent application for this discovery and invention is in process. "Endocide can be defined as an agent derived from a source that does not cause apparent poison in normal growth of the producing plant, but that will poison or inhibit and even eliminate the parent plant when induced in production. It will eliminate the parent plant or other individuals of the same species when externally applied," Li said. Li said current chemical, biological, and mechanical control measures of giant salvinia are very expensive and have failed to achieve their purpose. The endocides developed at SFA have two advantages over conventional herbicides that are being used in an attempt to control salvinia. "This approach is environmentally friendly since no external, new chemicals are added to the infested ecosystem," Li said. "Also, salvinia endocides are highly selective over other aquatic plants and do not cause them any harm." Li believes that endocides may have broad uses in controlling other fast-growing species or tissues, and its potential application will be explored in the future.